Here, legendary cookbook author and restaurateur Lidia Bastianich takes about her favorite family meals. F&W's #FOODWINEWOMEN series spotlights top women in food and drink in collaboration with Toklas Society. Follow the hashtag and share your best memories on Twitter (@foodandwine). I am truly fortunate that cooking—something I have loved ever since I was a small child-has become my life’s work. My days are filled with the challenges and delights of making delicious food, whether on television, for my cookbooks, or together with my chefs. However, I am most fortunate when I am home, in my free time, and I get to cook again, and it’s with and for my family. Sundays and holidays are the special days for cooking in my home. It is a time when I get to relax in my kitchen and cook a meal for those I love dearly: my mother, my children and my five grandchildren. My children and grandchildren have all been sniffing the aromas and enjoying the textures and tastes of my food since they were babies. When still unable to walk, I crushed leaves of basil, thyme and rosemary under their noses, and as soon as they could chew they would join us at the family table and tasted the dishes that the adults ate. By pre-school, they were helping me in the kitchen shape gnocchi or roll out fresh pasta dough. 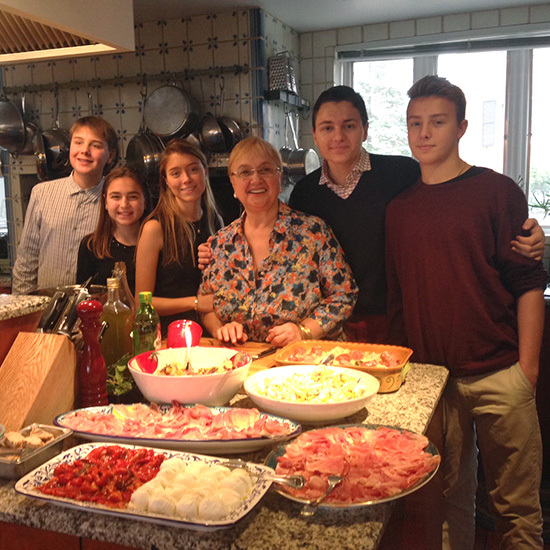 Now, my grandchildren range in age from eleven to seventeen and join me in various tasks in the kitchen, including chopping, mixing, baking and also clean up! Without a doubt, my favorite dishes to cook for them (and with them) are; simple spaghetti with tomato and basil sauce, a risotto with chicken alla Pitoca, gnocchi with butter and sage, Grandma’s chicken and potatoes and apple strudel.